Having launched their very first product in May, the Ioniser-Pro 600, Ioniser-Pro now have NINE products under their belt, including the Ioniser-Pro Blow (blower unit), Anti Static Curtain, ESD Wrist and Heel Straps and two different lengths of Ioniser bars. In October, Ioniser-Pro exhibited for the first time at Interplas and they did so with great success. There was strong interest in their “Iona the Ion” giveaway, and they received a huge number of leads. In addition, Ioniser-Pro met with PlastikCity and became an approved partner. One of their key objectives at Interplas was to launch the Ioniser-Pro Blow and Ioniser-Pro Blow F which are two speed, twin fan units designed for the fast flooding of your work area with static eliminating Ions. The Ioniser-Pro Blow F version has been designed with a special fine particulate filter capable of removing microscopic airborne dust and pollen particles to further improve your work areas whilst effectively managing static levels. Whilst at Interplas, Ioniser-Pro were asked by many visitors if they did a small “desktop” version of their static elimination bars. They took this feedback to their engineers who got straight on it, and within 2 weeks had manufactured the Ioniser-Pro 320. Another question asked was if they had an ‘air assisted’ bar to further help with blowing dust and contamination away from the destaticized material and extend the range of the bar. After a month in design and another month in manufacture, Ioniser-Pro are now at the testing stage for their Ioniser-Pro Air-Assist and they anticipate launching this in January 2018. 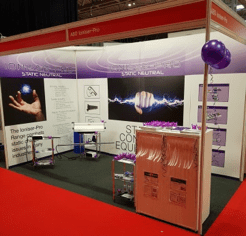 “We are very much looking forward to 2018, with expanding our product range, exhibiting at events and getting the Ioniser-Pro brand out there it is promising to be a very busy year to come. “Thank you to all that dropped by to see us at Interplas and The Engineering Design Show, we are looking forward to exhibiting at many other events next year. To see all of our products pop on the website www.ioniser-pro.co.uk.